Ghost Town Maggie Valley (officially named Ghost Town in the Sky) was a very popular Western-themed mountaintop amusement park, located in Maggie Valley NC. The Park was founded in 1961 by R.B. Coburn, who was originally from Virginia, but later moved to Maggie Valley NC. R.B. Coburn had been visiting the valley for some time with his family and fell in love with the area. R.B. was a successful businessman, having started several successful businesses in Tennessee. After visiting many different ghost towns throughout western America, R.B. 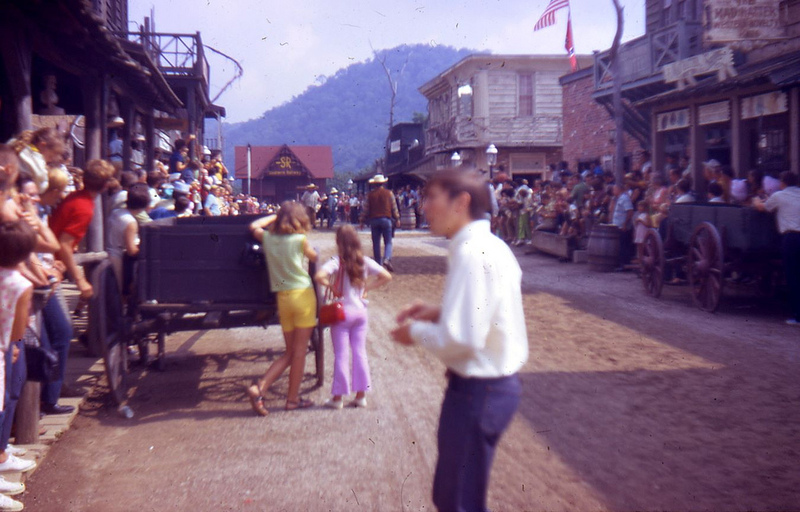 Coburn decided to return to Maggie Valley, and build a Wild West based theme park on top of Buck Mountain in Maggie Valley. Buck Mountain has an elevation of 4,600 feet and provides beautiful mountain scenery all around it. Ghost Town Maggie Valley was designed and constructed by Russell Pearson in 1960 for approximately $1 million. Construction of Ghost Town began on September 1, 1960. Three bulldozers made their way to the top of the mountain to shave 45 feet of dirt and rock off the top. This area would soon become the Old West town, and home to the famous gun fights. Thousands of yards of dirt and rock were then moved to the shoulders of the western town and became the foundations for surrounding towns: Indian Village, Mountain Town, and Mining Town. Building construction for the four different towns started in mid-November of 1960, using 200 local men to get the job done. By early May 1961, more than 40 buildings were complete, both inside and out. All buildings were true life size replicas of similar buildings from the era. All building supplies were sourced locally and included 300,000 feet of lumber, 200,000 feet of plywood, and 20,000 pounds of nails. The grass seed alone cost more than $3,000 in 1960. Today, that same seed would cost more than $25,000. At the time of Ghost Town’s grand opening, there were only two ways up to the top, The Incline Railway, and shuttle bus. The shuttle bus was only available to people with specials needs, and staff. The Incline Railway (a funicular railway) brought people to within 200 feet of the top of the mountain. The construction of the Incline Railway was a feat in and of itself. Bulldozer operators carved out a 50 foot wide, 3,364 foot long clearing up the side of Buck Mountain. This would become the roadbed for the Incline Railway. A 25-ton bulldozer was moved up and down the mountainside, and connected to another bulldozer at the top, by a 4-inch cable. The bulldozer was worked up and down like a yo-yo. Again, everyone that performed this work was local. The railway itself is made up of 21,000 feet of steel rail. There were two cars, each capable of holding 48 passengers. The cars were attached to three separate cables. Each cable weighed 6,000 lbs, for a total of 18,000 lbs, for all three. The cars were operated electronically from the top of the mountain, using 440-volt motors that weighed more than 25,000 lbs each. The Incline Railway was not only the nation’s very first double incline railway but also the steepest. The Ghost Town Incline Railway rises 1,200 feet at varying grades, from 30% to 76.1%, over the 3,364 feet it travels. In some places, it was nearly straight up, making for an exciting ride up to the top. Assembling and installing the Incline Railway was also a challenge. A “Skidder” at the top of the mountain was used to pull a cart up and down the mountain, containing the workers, rails, and tools. Installation was a dangerous job, and caught the attention of Maggie Valley residents most of the winter, as they watched Ghost Town come together. Fortunately, all went well, and installation was completed with no injuries. Construction of Ghost Town in the Sky, as it was formally named, was completed in May of 1961. The park officially opened in June 1961. Ghost Town in the Sky very quickly became one of the most popular attractions in Western North Carolina. On some days, the park had more than 10,000 people in attendance. One of the major additions to Ghost Town that occurred during the winter and spring of 1962 was the double chair lift. The chair lift provided another unique and exciting way to reach Ghost Town from Maggie Valley. The chair lift was specially ordered from Italy and could transport 900 passengers per hour, using its 160 double chairs. The lift was operated from the top of the mountain by a 440-volt motor that generated over 200 horsepower. The chairs traveled up the steep mountain using seventeen towers, a drive, and two return terminals, which supported the 1-5/16″ cable. The lift moved people 3,370 feet up the mountain at a speed of 3.5 mph. The chair lift cost $150,000 in 1962 dollars. Today that same lift would cost $1,207,160! Ghost Town in the Sky quickly grew to be the largest attraction in Western North Carolina and one of the largest in the country. The park brought thousands of visitors each day to Maggie Valley, NC. Brenda O’Keefe and her husband Joey, owners of the famous, and now closed, Joey’s Pancake house used to drive through Maggie Valley each morning, and count the cars at the hotels to determine how much pancake batter to make each day. On holidays during the summer, Ghost Town would have up to 10,000 visitors. Ghost Town attracted millions of visitors to Western North Carolina and Maggie Valley NC over the years and resulted in an economic boom for the small town of Maggie Valley. In fact, many new hotels, motels, and businesses were created after the opening of Ghost Town in 1961. This included the Maggie Valley Club and Golf Course. Ghost Town employed 75 to 100 personnel, which included gun fighters, can-can girls, maintenance crews, ticket staff, parking staff, chair lift crews, Incline Railway crews, rider operators, etc. Interestingly, stores in the park were leased, operated and staffed independently by Maggie Valley businesses owners, further assisting with the local economy. As Maggie Valley visitors arrived at the Ghost Town amusement park, they would be greeted by the large Ghost Town sign, with the ticket office below, and the large A frame building, with a restaurant and merchandise for sale to the right. Behind both buildings, was a clear cut up the mountain that visitors would have to ascend to reach the core park. Using the Incline Railway or the chair lift was a unique aspect of Ghost Town on the Sky. Both allowed visitors to slowly transition from modern times to the Old West, as they slowly ascended Buck Mountain. Ghost Town Maggie Valley had about 120,000 square feet of building space that was divided into the several different original towns. Each town was located at different elevations of the park. So began one of the famous “shoot out” shows held every 40 minutes in Ghost Town. These various shows were performed by a group of locals, including the famous Apache Kid, played by Robert Bradley. The shoot outs were incredibly popular and became a signature attraction for Ghost Town. The shoot outs in the streets helped children and adults realize their imaginations of being a cowboy or cowgirl in the Wild West, first hand. Being an amusement park, Ghost Town also had rides and lots of them. Being at the top of a mountain, provided extra thrills on many of them. Some of the rides you would find over the years included The Monster, Mining Town Swing, Goldrusher, Tilt-a-world, Red Devil, Sea Dragon, Undertaker, Dream Catcher, Casino, Round Up, Silver Bullet, and Lil Devil. Ghost Town also had horseback rides, ranging from 30 minutes to two hours, where visitors could ride through the woods to Cataloochee Ranch, ending with camping. You could even ride a stagecoach and a train! Ghost Town also had a number of stores and restaurants as well, including The Red Dog Saloon, Golden Nugget Casino, Frontier Shop, General Store, Silver Dollar Saloon, Mad Hatter Shop, Snack Bar, Apothecary, Rock Shop, Chinese Laundry, Trading Post, Pack Mule Gift Shop, Blacksmith Shop, and many more. The Church in Ghost Town had services each Sunday morning. Local pastors for the various churches would come up and conduct services and were able to keep the donations. During the early 1970s, Ghost Town’s peak would be over 400,000 visitors annually, which declined significantly by 2008. The decline in attendance was two fold Mechanical issues with rides, causing frequent ride closures, and American interest in the Wild West declined through the 70s, to almost zero interest in the eighties and beyond. In 1973, the park was sold under a stock swap to the National Forest. R.B. Coburn bought it back in 1986, and added the Red Devil Roller Coaster. This coaster became a signature ride, and can still be seen today on the mountain side. Unfortunately, many of the park’s signature rides during this time were constantly breaking down, and not available to visitors for extended periods of time. The closed rides caused visitors to not return, resulting in the gradual decline in attendance. Both the chairlift and Incline Railway to the top also had numerous problems, causing Coburn to spend thousands of dollars keeping them running. One infamous day in July 2002, the chairlift malfunctioned and left riders stranded in mid-air for two hours on a hot day, in the rain. Following this incident, the park closed in 2003, after successfully running for 41 years. Ghost Town Maggie Valley was again resold in August 2006. After $38 million in repairs and renovations, it reopened its doors with everything running, except the Incline Railway to the top, the train, and The Monster. By 2009 the park filed for bankruptcy, after spending an additional 11 million dollars, with 6 million of that on the Cliffhanger Roller Coaster. Ghost Town continued to struggle financially through 2009, and the park closed again. The owners/ CEOs of Ghost Town failed to make payments for liability insurance for three months, so the insurance was canceled. Unfortunately, this happened just before a large mudslide on February 5, 2010. The mudslide occurred when retaining walls at Ghost Town failed. Fortunately, no one was injured, but 40 homes were evacuated, and three homes were damaged below the failure. Rich Cove Road, the main access road, was buried. The owners then scrambled to try to pay the late payments, but by then it was too late to cover the damage that the mudslide had already cause to the local homes down the mountain. Credible local sources claim that the owners knew about a year before the mudslide that the land and retaining wall was unstable. Ghost town again fell under foreclosure proceedings and remained closed. Alaska Presley, Maggie Valley resident and Ghost Town investor during the 1960s, bought Ghost Town out of bankruptcy in 2012. She managed to open the park from 2012 to 2014 with the hopes of turning it into an Appalachian Village. But, in 2015 she was unable to open the park’s doors due to expenses associated with bringing the park back up to date. Ghost Town sadly remains closed to this day, and while its closure and difficulties had a significant impact on Maggie Valley and surrounding areas, initially, Maggie Valley NC has reinvented itself and is actively making a return to popularity, refocusing on being the hub for many mountain outdoor and recreational activities. Ghost Town is located on the west end of Maggie Valley NC, off the Maggie Valley exit of the nearby Blue Ridge Parkway and next to the Great Smoky Mountains National Park. While Ghost Town is now closed, and inaccessible to the public, Maggie Valley continues to grow and thrive. See all of the great things there are to do in Maggie Valley. Ghost Town in the Sky To Reopen – Spring 2019! Special thanks to our friends Sue and Brad Pendley of Maggie Mountaineer Crafts for the use of their photos and materials, which contributed greatly to the content of this article. Also to Myron Carter for providing many of the photos used in this article. The Story of Western Carolina’s Ghost Town in the Sky by Frank E. McDowell, Jr. Personal discussions and interviews with many Maggie Valley residents.